The Penthouse Suite at Calibishie Cove features a large wraparound balcony with private plunge pool, plus a rooftop balcony. Calibishie Cove is located on Dominican’s northeast coast and features organic gardens, and yoga classes and wellness retreats. Breakfast and dinner can be prepared for private balcony dining. 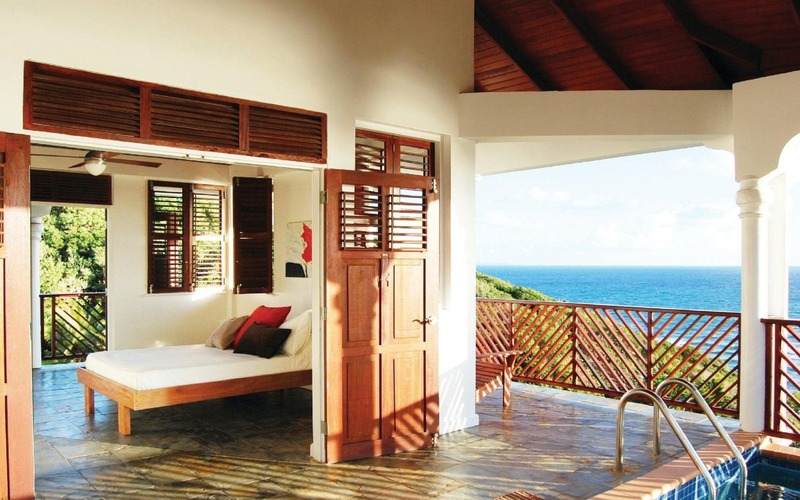 Each room at Calibishie Cove is air-conditioned and includes a private balcony, a dining area and a wardrobe. Rooms feature hardwood floors, local artwork and large windows overlooking the water. The Penthouse Suite has a rooftop balcony and a private plunge pool. The hotel also has banquet facilities and can organize tours around the island. Fly into Douglas-Charles Airport (DOM), formerly known as Melville Hall. Calibishie Cove is located about 20 minutes from the airport. Visit Calibishie Cove’s website for more information.